Join New Voices Pittsburgh for the special event You Wouldn't Expect dinner and discussion* in partnership with demaskus Theater Collective during Women of Color HERStory Month® 2016, Saturday, March 26, 2016, 5:30 P, at the August Wilson Center for African American Culture. In between performances, audience members are invited to dine and discuss the reproductive and social justice implications of the United States eugenics program with New Voices and demaskus Theater Collective! $10 - Dinner and panel discussion only! Paris Hatcher is a Black, queer feminist from Greensboro, North Carolina. With over 10 years of experience on the local, national, and international level, Paris has been working with leading organizations to amplify the leadership of marginalized communities, win public policy campaigns, and advance reproductive and sexual health and justice, gender justice and queer liberation. Notably, she co-founded and was the Executive Director of SPARK Reproductive Justice NOW, one of the leading reproductive health and justice organizations in the Southeast. She completed her Masters of Arts in Africana Women’s Studies at Clark Atlanta University with a research focus on Caribbean women’s activism and social movements. Paris was a Board member of Southerners On New Ground (2008-2014); a founding Board member for the Groundswell Fund(2007-2012). She recently worked for Race Forward, the Center for Racial Justice Innovation as the Network Strategies Manager. Currently she is Principal at Rhombus Consulting Group, rabble rouser extraordinaire at Black Feminist Future, and co-founder of Black Freedom Outfitters. 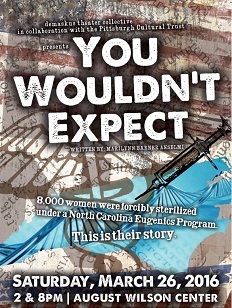 "Between 1933 and 1973, North Carolina sterilized 8,000 people, as part of a eugenics program that sterilized 60,000 women nationwide. "African-American women were disproportionately targeted" says playwright Marilynn Anselmi whose new stage play is based upon true events surrounding the North Carolina Eugenics Program (c. 1946 – 1968). This production is made possible through the generous support of The Heinz Endowments and The Pittsburgh Foundation". Purchase tickets to the 2 pm or 8 pm performance visit: You Wouldn't Expect: Performances!